Summary: Newcomer to the market is looking to provide signals that will bring your trades to life. Today I’m looking at a new binary options signal service that sells itself as a complete web solution that provides awesome trades, BinaryRyano. They are currently providing a 5 day trial which allows traders to test out the signals for a short period of time. The creator of the software is Ryan Eisenhut, who is the founder of Eisencorp. He doesn’t hide behind any alias, but he doesn’t have any reputation the binary options market. Ryan is located in the United States and can be contacted via phone at 1-262-361-3731, or email [email protected]. It’s really difficult to say whether or not the BinaryRyano signal service sets itself apart from the rest of the marketplace, because there is very little information provided. Signals are generated from the meta-trader 4 platform on 25 currency pairs for 15 minute, 30 minute and 1 hour expiry times. There are rules in place that determine and generate the signals, but the trade logic is not discussed on the website in any detail. In fact, there is little discussed on the website at all. Ryan wants to take a fresh approach to the binary options market by offering more transparency and not making “false promises.” He doesn’t want to rely on fake testimonials, but instead wants traders to take advantage of the 5 day free trial and have this be the proof. There are elements of the approach that I appreciate, but I do believe that the creators should be providing us with some statistics, like a daily account of all their signals. The 5 day free trial is a great way of testing a system, but it is a very short sample size. Whereas daily trading results would prove to the community that the system can perform in the long term. At $99.95/month the BinaryRyano signal service isn’t cheap. At a price like this, I would expect an actual analyst to be providing the trades, and not a software like they are utilizing. Regardless, hopefully the software is good, and worth the exorbitant price. Due to the fact that there is very little information about the trade logic, and how this all works, I decided I should do some additional research. 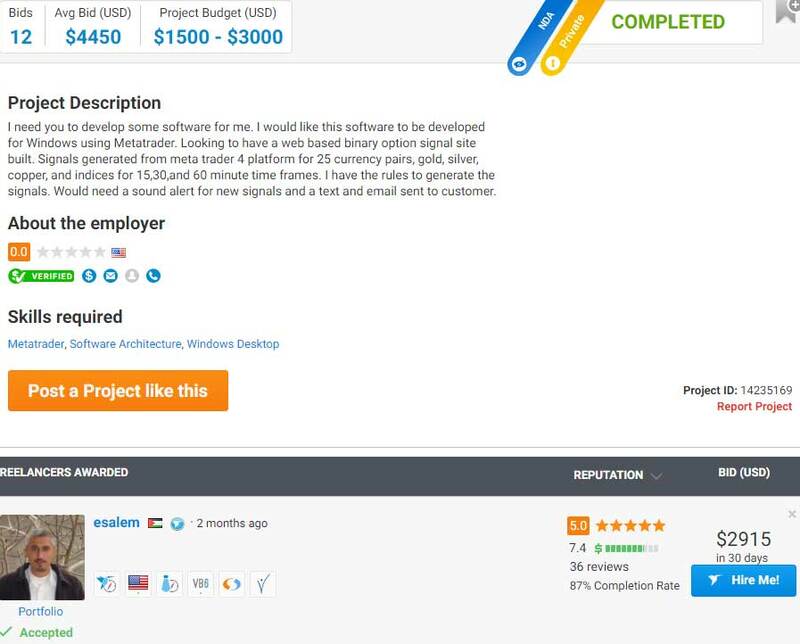 In doing so, I uncovered the project on Freelancer, which shows that this product was developed for $2915 in 30 days. I have no issues with this price, but it does show that Ryan is outsourcing his work, and does not have access to his own coding team. Despite pushing transparency, the BinaryRyano service is lacking when it comes to trading results. The creator of the system believes that the 5 day trial is enough to prove the worth of his signal service, but I believe this is too short of the sample size to give us a true depiction. I’ve used many systems, and many of them can string a few days of success together, but very few can continue on for weeks or months. This is something that Ryan can rectify very quickly. All he has to do is start monitoring the trades, and providing a daily breakdown of all the wins and losses. This way we can watch the system from afar, and monitor its progress over a long period of time before signing up. I believe that this, in conjunction with the free trial would be a very transparent approach. At this point in time, I’m on the fence when it comes to the BinaryRyano signal service, because there is little to no information about the trade logic and there are no trading results. I’ve tried signing up for the free trial to test the system out, but I have not received my confirmation email despite signing up well over an hour ago. I will update this review if there is any more information to be provided. Thank you for stopping by, and please leave your comments and reviews about the service now.